My mum’s friend has got engaged. This is her third marriage. Mum wanted a card, but one which wasn’t overly ‘love is forever, isn’t this wonderful’ in manner. A difficult task. 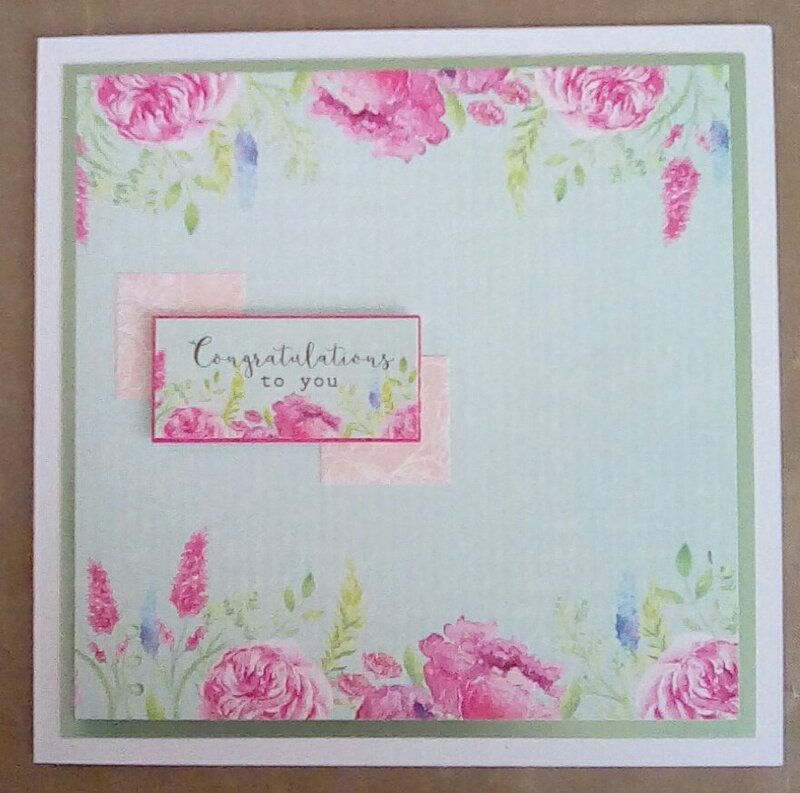 I love the ‘Congratulations to you’ sentiment from Craftwork Cards’ Heritage Rose collection because it’s so versatile, and this seemed as fitting occasion to use it again. Because I was using a simple sentiment, I either wanted to make a very complex, detailed card to frame it, or to keep the whole theme simple, letting the paper and sentiment do the work. 1) Mat a piece of the turquoise paper with flowers across top and bottom from Heritage Rose 6×6 paper pad onto a piece of mint green mirri card 16×16 cm and attach to card front. 2) Cut two squares from the peach floral paper from Heritage Rose 6×6 paper pad, each measuring 3×3 cm. Attach one 1cm in from left, 5.3cm from top on left of card front. Attach the other 6.5cm in from right edge, 5.3 cm up from bottom edge. 3) Mat the ‘congratulations to you’ sentiment onto a piece of pink pearlescent card 6.2x3cm. Use 3d foam pads to attach this over the two peach squares, so around 1cm of peach can be seen to each edge. 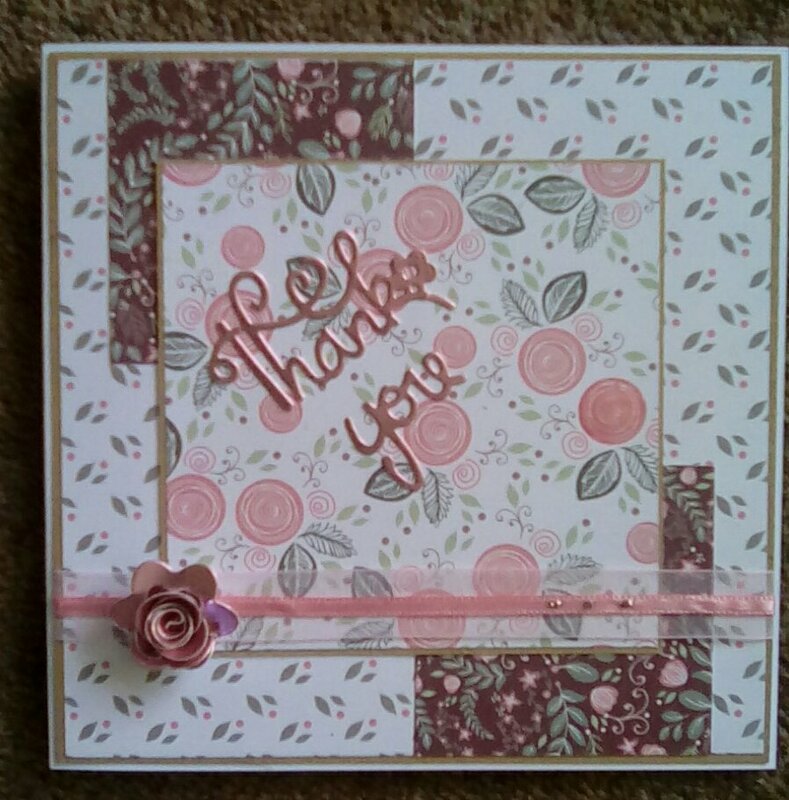 This entry was posted in cards, craft and tagged card; craftwork cards; Heritage Rose on June 28, 2016 by Isn't She Crafty. 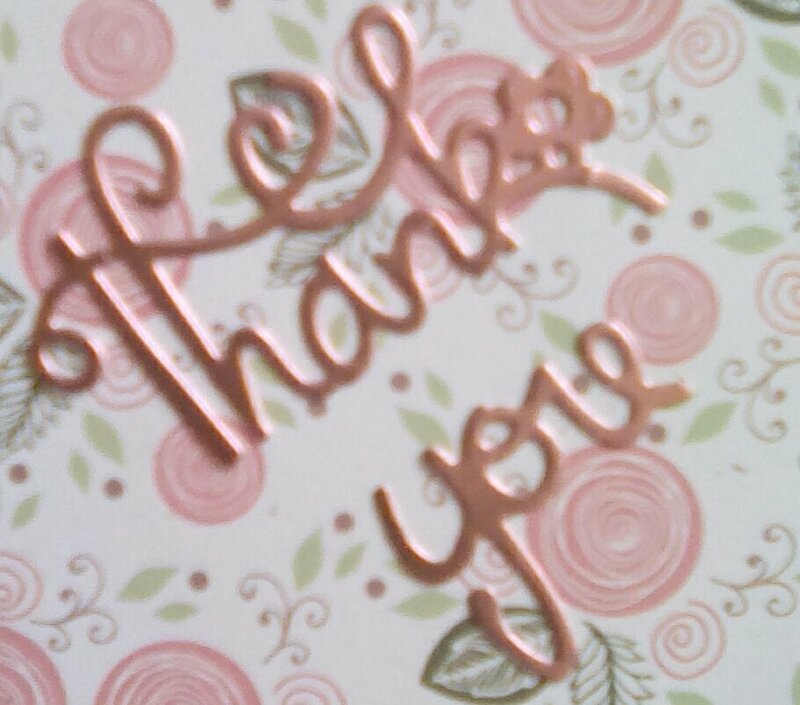 A simple thank you card this time. The recipient is female, 50something, feminine but not overly girly. 1) Cut a piece of Kraft card to 1404x1404mm. Mat a piece of white paper with green leaves cut to 1402x1402mm on top. 2) Cut two pieces of brown flowery paper to 600×600. Stick these in top left and bottom right corners, leaving a 100mm border to the side, but ensuring it’s flush against top and bottom respectively. 3) Mat a piece of white paper with large pink flowers cut to 1000x1000mm onto a 1002x1002mm piece Kraft card and stick this in centre of card front. 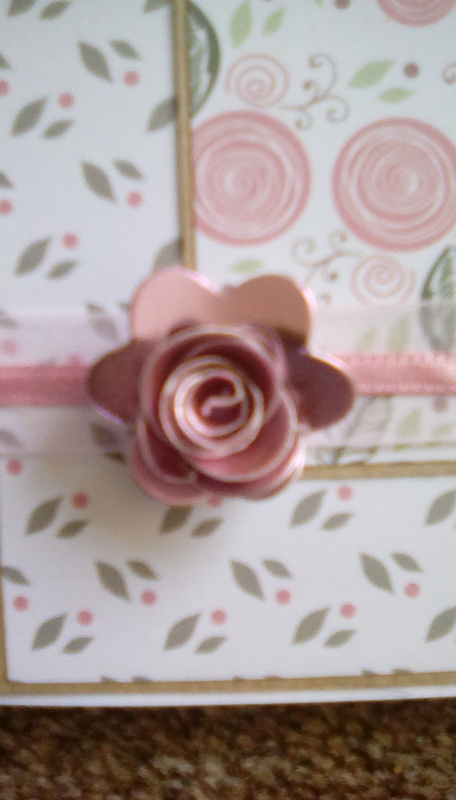 4) Wrap a piece of sheer pink ribbon around bottom of card, approximately 1/3 of the way up. Wrap the narrow pink ribbon on top of this. Fasten the ends behind card front for neatness. 5) Attach card front to card blank. 6) Die cut sentiment from pink mirriboard and stick on centre panel. I like the more jaunty angle, but it depends on the style you’re going for. 7) Die cut a roll-up flower from pink mirriboard. Roll using a quilling tool or tweezers from outside in, and attach to bottom left corner of the centre panel, on top of the two ribbons. 8) Add three dots of glitter glue on the narrow ribbon, in bottom right hand corner of centre panel. This entry was posted in cards, craft and tagged cardmaking; Tonic Studios on June 9, 2016 by Isn't She Crafty. A friend of my mum’s retired last year. He’s been petrol head for as long as anyone remembers, but it’s all about the motorbikes for him – when their street flooded he moved his bike into the house to protect it! Since retiring, this friend has volunteered in a range of settings, culminating in him discovering the Blood Bikes service. 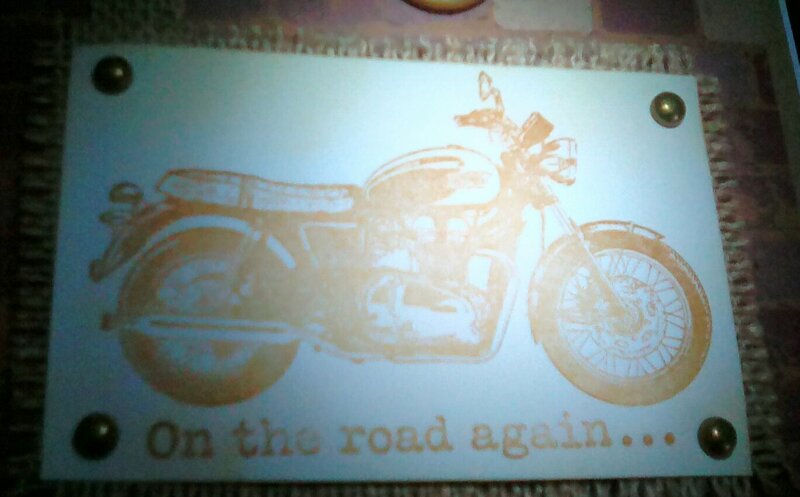 When he passed his blues and twos training, thus qualifying him to ride his motorbike on blue lights to deliver blood in emergency situations, mum wanted a card to commemorate it. 1) Cut a piece of Kraft card to 14.5×14.5 cm. Mat a piece of brick patterned paper 13.5×13.5 cm on top (I wanted a large border, but you could decrease size of border by using a second mat or a slightly larger piece of patterned paper). Attach to card blank, with fold to the left. 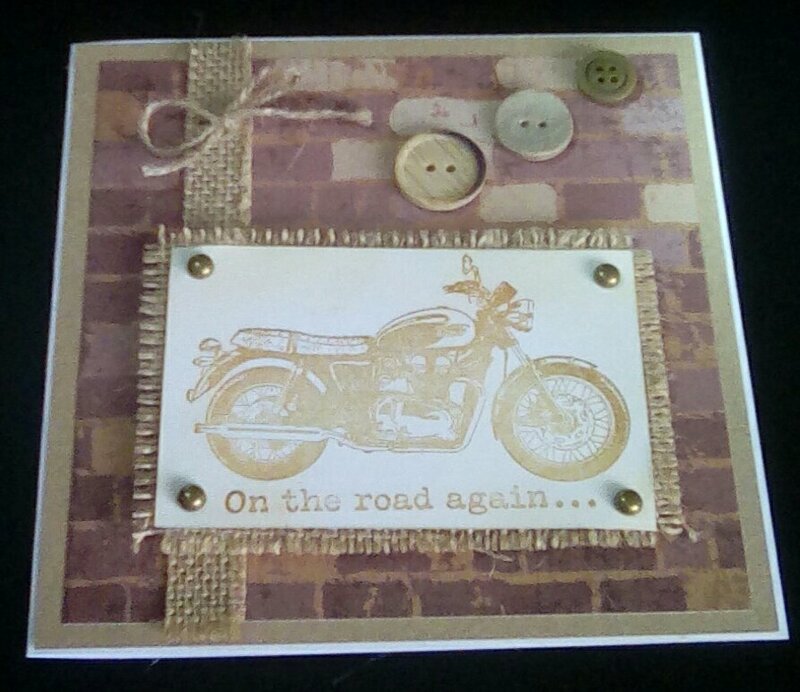 2) Stamp motorbike and ‘on the road again’ sentiment in brown ink onto white stamping card. Cut down to 9.9×6.4cm. 3) Ink the edges, making sure the very edges are darkest, fading towards centre. The middle of my motorbike is still white as I wanted the eye to be drawn to it. 4) Cut a piece of burlap paper 11×7.5cm. Attach the motorbike image, placing a brad in each corner. Remove one or two threads per side of the burlap to give a frayed look. 5) Attach a piece of burlap 14.5×1.5 cm running from top to bottom of card front, approximately 2.5cm in from edge of Kraft card layer. 6) Fasten the stamped image to bottom of card, leaving approximately 2cm border around base, left and right. It should completely overlap the burlap strip. 7) Tie a bow using the natural twine and fasten on the burlap strip. 8) Glue the buttons in a diagonal line in size order, largest nearest the stamped image. The size of buttons will change where you put this line, but I wanted it to be to the right of the card, not central. I chose this sentiment as I didn’t want a traditional congratulations, it didn’t seem fitting. I liked how it acknowledged the recipient’s hobby and that he’s revived a career through it. This entry was posted in cards, craft and tagged card; Sara Davis; male on June 1, 2016 by Isn't She Crafty. This entry was posted in Uncategorized on June 1, 2016 by Isn't She Crafty.